Scientists said yesterday that they have discovered a tiny genetic mutation that largely explains the first appearance of white skin in humans tens of thousands of years ago, a finding that helps solve one of biology’s most enduring mysteries and illuminates one of humanity’s greatest sources of strife. The work suggests that the skin-whitening mutation occurred by chance in a single individual after the first human exodus from Africa, when all people were brown-skinned. That person’s offspring apparently thrived as humans moved northward into what is now Europe, helping to give rise to the lightest of the world’s races. Leaders of the study, at Penn State University, warned against interpreting the finding as a discovery of “the race gene.” Race is a vaguely defined biological, social and political concept, they noted, and skin color is only part of what race is — and is not. In fact, several scientists said, the new work shows just how small a biological difference is reflected by skin color. The newly found mutation involves a change of just one letter of DNA code out of the 3.1 billion letters in the human genome — the complete instructions for making a human being. The work raises a raft of new questions — not least of which is why white skin caught on so thoroughly in northern climes once it arose. Some scientists suggest that lighter skin offered a strong survival advantage for people who migrated out of Africa by boosting their levels of bone-strengthening vitamin D; others have posited that its novelty and showiness simply made it more attractive to those seeking mates. The work also reveals for the first time that Asians owe their relatively light skin to different mutations. That means that light skin arose independently at least twice in human evolution, in each case affecting populations with the facial and other traits that today are commonly regarded as the hallmarks of Caucasian and Asian races. Several sociologists and others said they feared that such revelations might wrongly overshadow the prevailing finding of genetics over the past 10 years: that the number of DNA differences between races is tiny compared with the range of genetic diversity found within any single racial group. Even study leader Keith Cheng said he was at first uncomfortable talking about the new work, fearing that the finding of such a clear genetic difference between people of African and European ancestries might reawaken discredited assertions of other purported inborn differences between races — the most long-standing and inflammatory of those being intelligence. “I think human beings are extremely insecure and look to visual cues of sameness to feel better, and people will do bad things to people who look different,” Cheng said. The discovery, described in today’s issue of the journal Science, was an unexpected outgrowth of studies Cheng and his colleagues were conducting on inch-long zebra fish, which are popular research tools for geneticists and developmental biologists. Having identified a gene that, when mutated, interferes with its ability to make its characteristic black stripes, the team scanned human DNA databases to see if a similar gene resides in people. To their surprise, they found virtually identical pigment-building genes in humans, chickens, dogs, cows and many others species, an indication of its biological value. They got a bigger surprise when they looked in a new database comparing the genomes of four of the world’s major racial groups. That showed that whites with northern and western European ancestry have a mutated version of the gene. Skin color is a reflection of the amount and distribution of the pigment melanin, which in humans protects against damaging ultraviolet rays but in other species is also used for camouflage or other purposes. The mutation that deprives zebra fish of their stripes blocks the creation of a protein whose job is to move charged atoms across cell membranes, an obscure process that is crucial to the accumulation of melanin inside cells. Humans of European descent, Cheng’s team found, bear a slightly different mutation that hobbles the same protein with similar effect. The defect does not affect melanin deposition in other parts of the body, including the hair and eyes, whose tints are under the control of other genes. 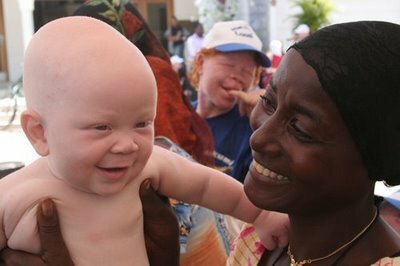 A few genes have previously been associated with human pigment disorders — most notably those that, when mutated, lead to albinism, an extreme form of pigment loss. But the newly found glitch is the first found to play a role in the formation of “normal” white skin. The Penn State team calculates that the gene, known as slc24a5, is responsible for about one-third of the pigment loss that made black skin white. A few other as-yet-unidentified mutated genes apparently account for the rest. Although precise dating is impossible, several scientists speculated on the basis of its spread and variation that the mutation arose between 20,000 and 50,000 years ago. That would be consistent with research showing that a wave of ancestral humans migrated northward and eastward out of Africa about 50,000 years ago. Unlike most mutations, this one quickly overwhelmed its ancestral version, at least in Europe, suggesting it had a real benefit. Many scientists suspect that benefit has to do with vitamin D, made in the body with the help of sunlight and critical to proper bone development. Sun intensity is great enough in equatorial regions that the vitamin can still be made in dark-skinned people despite the ultraviolet shielding effects of melanin. In the north, where sunlight is less intense and cold weather demands that more clothing be worn, melanin’s ultraviolet shielding became a liability, the thinking goes. Today that solar requirement is largely irrelevant because many foods are supplemented with vitamin D.
Some scientists said they suspect that white skin’s rapid rise to genetic dominance may also be the product of “sexual selection,” a phenomenon of evolutionary biology in which almost any new and showy trait in a healthy individual can become highly prized by those seeking mates, perhaps because it provides evidence of genetic innovativeness. Cheng and co-worker Victor A. Canfield said their discovery could have practical spinoffs. A gene so crucial to the buildup of melanin in the skin might be a good target for new drugs against melanoma, for example, a cancer of melanin cells in which slc24a5 works overtime. But they and others agreed that, for better or worse, the finding’s most immediate impact may be an escalating debate about the meaning of race. Recent revelations that all people are more than 99.9 percent genetically identical has proved that race has almost no biological validity. Yet geneticists’ claims that race is a phony construct have not rung true to many nonscientists — and understandably so, said Vivian Ota Wang of the National Human Genome Research Institute in Bethesda. Can we agree we are all racially the same? Ok. Now, please don’t accuse me of bring religion into it for posting this. See for yourself.